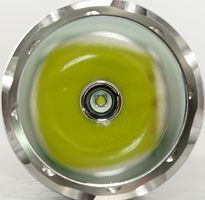 ThruNite has made many lights, this is their biggest thrower light to date. 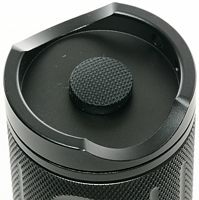 It has a XM-L led and uses a magnetic ring for mode selection and standby, on/off is controlled with a tail switch. 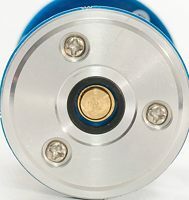 The light is made of aluminum with hard anodized (Type 3) finish. 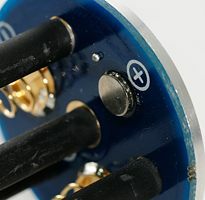 This light is very close in design to TN30 that uses 3 leds. I got the light without any accessories. 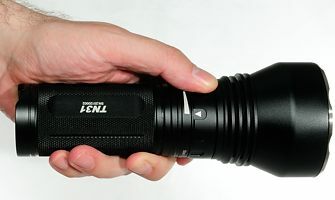 The light uses a large smooth reflector with a XM-L led. 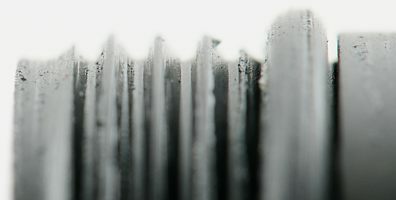 The head designed includes a some heat sink fins. 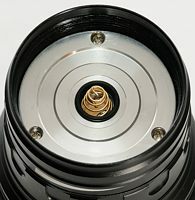 Just below the heat sink part is the ring to control the light. 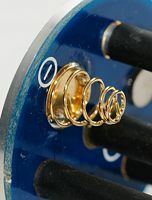 The ring turns smoothly and has good clicks. The light has six brightness settings, standby and strobe on the ring. 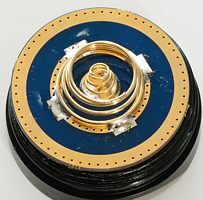 The backside of the head has a spring for connection to the battery carrier. 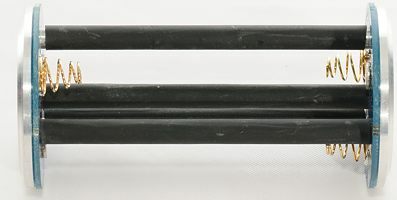 The battery tube has triangular threads with anodizing and a O-ring to seal the connection. 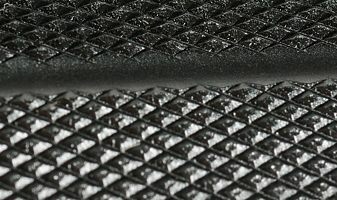 The knurling has some bite to it. The tail has not one, but two springs. This is because the light has an electronic switch. 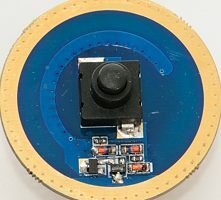 This electronic switch reduces the wear on the mechanical switch, and the price is an insignificant current draw (20uA-50uA). The switch is a forward switch, i.e. press it half way down for momentary on. 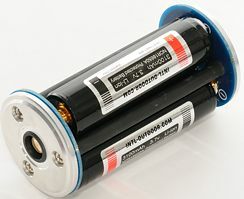 The light uses a battery carrier, that holds 3 18650 batteries in series. 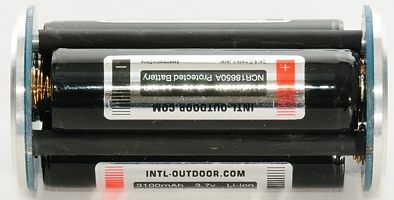 The carrier can handle batteries up to 70 mm long, but the fattest batteries are a very tight fit (See my battery size measurements). The carrier is symmetric, i.e. it can be used both ways in the light. Here is all the part the light can be disassembled in without tools. 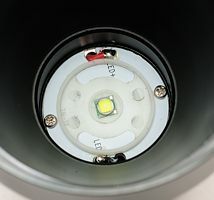 A look at the led. 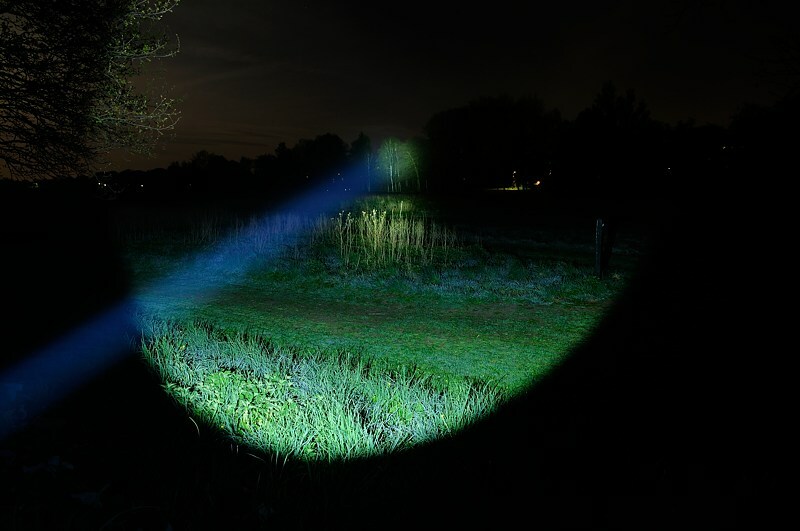 This light is a great thrower and has enough spill to make it generally useful. The ring interface makes it easy and fast to select brightness. With the 3 batteries is does also have a good runtime. 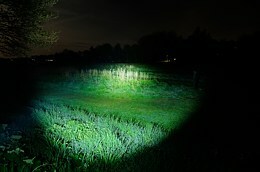 The light is rated for use with 3 18650 LiIon batteries. 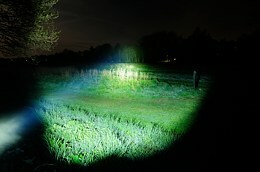 The light uses a a Cree XM-L U2 led. In the above table I have collected all modes. The current is measured at 11.1 volt. All the estimated runtimes are with a 3100mAh LiIon battery. 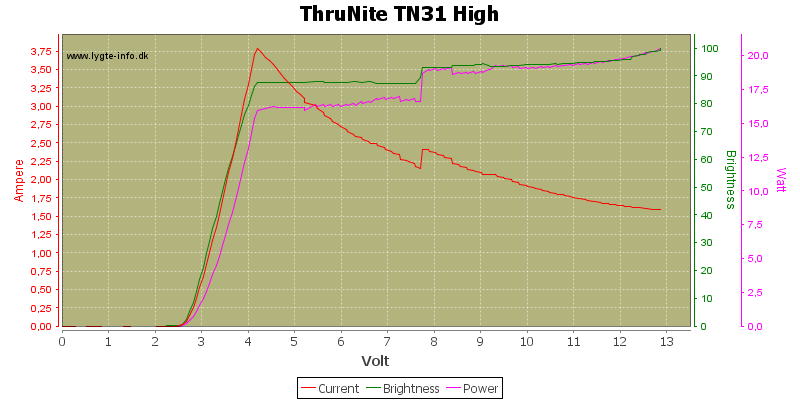 The first voltage sweep is done in high mode. Because the light one has one led it works down to a very low voltage. 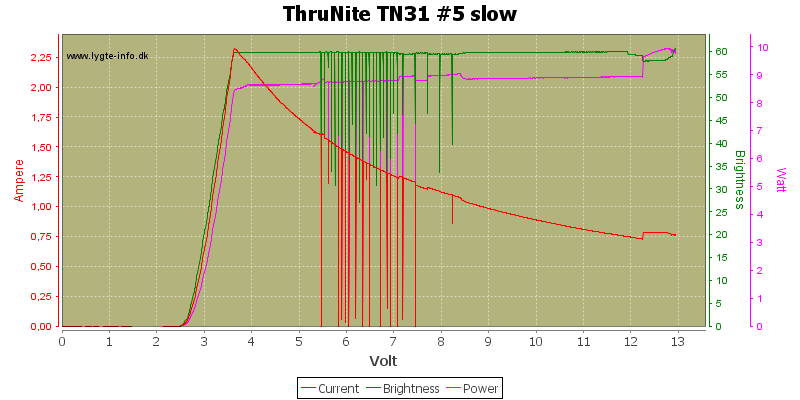 To find the battery that gives longest runtime on full brightness, check my battery comparison and find the longest cyan bar in the 2.8 volt chart. 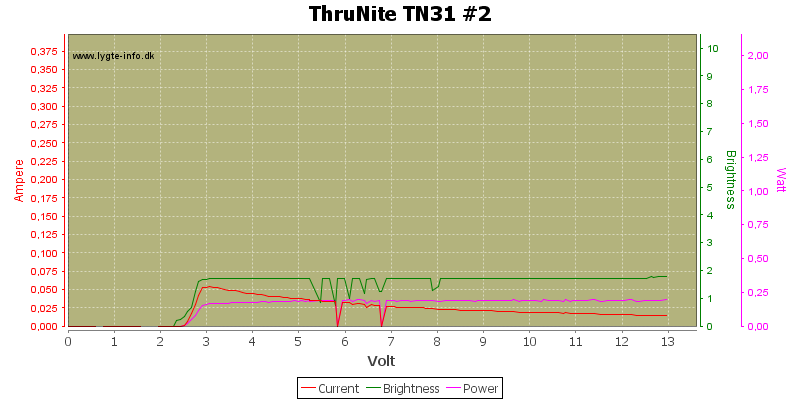 The drop at about 7.7 volt is probably the step down to reduced brightness. The light reduces brightess slightly after about 1½ minute. 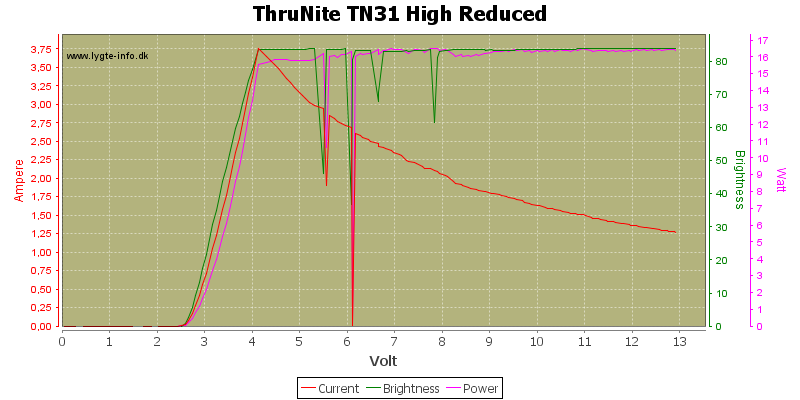 There is no surprise in the lower brightness settings, they uses less power and has less brightness. 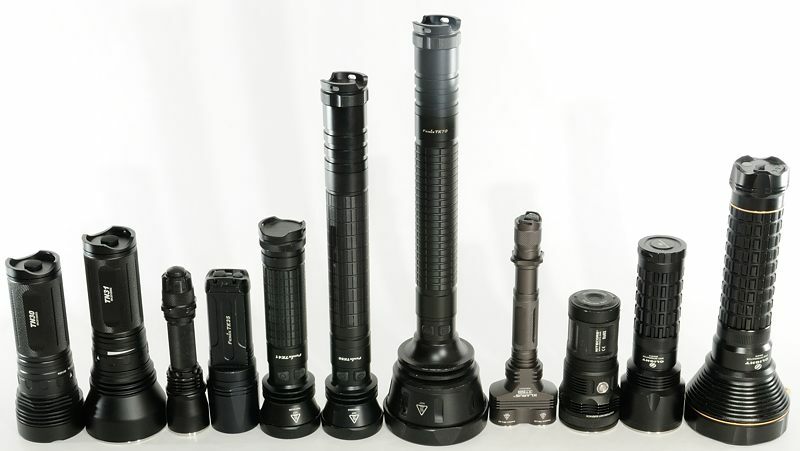 They do also stabilize the light at a lower voltage. All the drops in the light is the battery low warning. 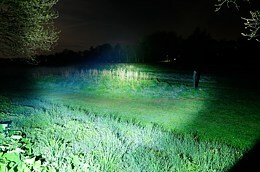 Because this light uses on a single led it can produce full brightness down to about 4 volt. That would be very damaging to unprotected batteries, i.e. when the low voltage warning starts flashing, it is time to turn the light off! 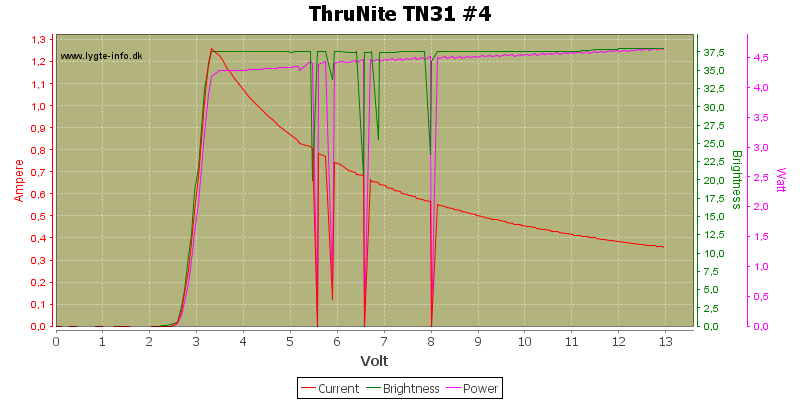 To get a more precise threshold for the battery low warning I did a much slower voltage sweep and it looks like it starts at about 8.2 volt or 2.73 volt for each battery. 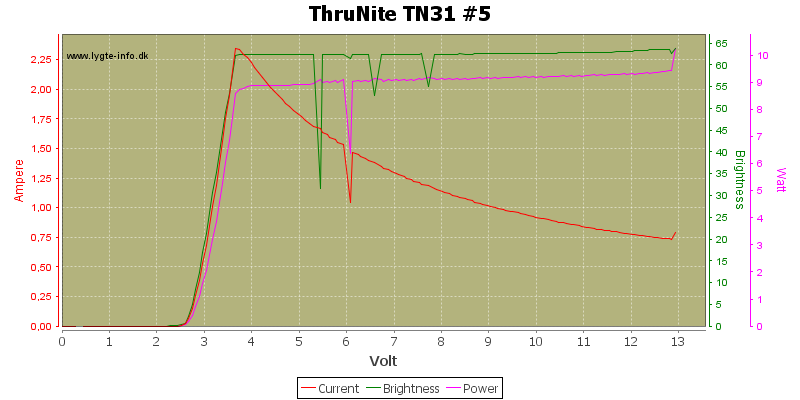 This is a good voltage for a battery warning, depending on actual LiIon battery chemistry the minimum voltage is somewhere between 2.5 and 3 volt. 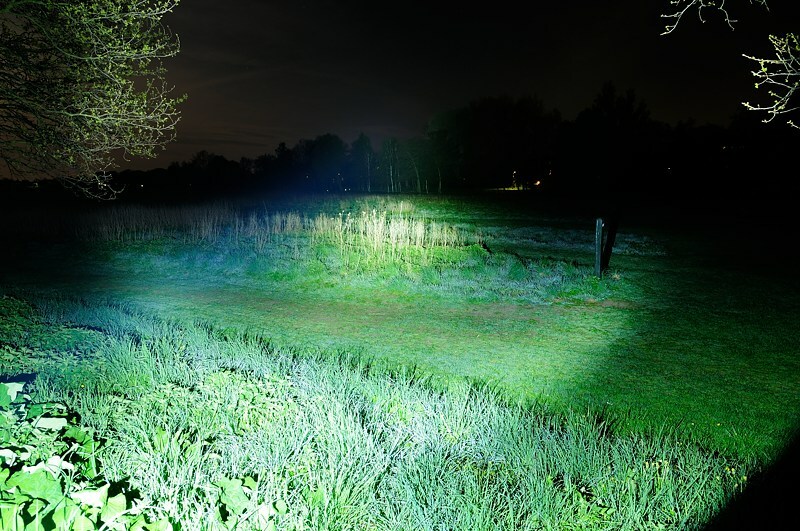 When doing the runtime it can be seen that the light reduces the brightness after about 1½ minutes. 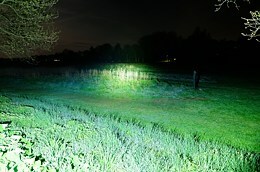 The turn on in the strobe is a bit slow, but not anything visible. 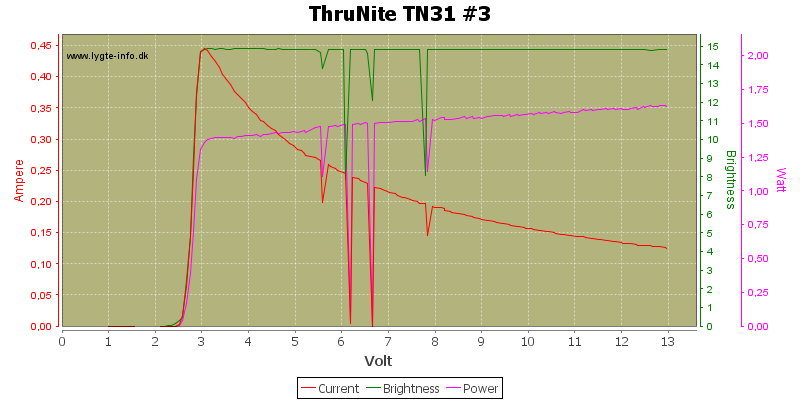 The light is current controlled, but has some high frequence noise, on the #2 setting it is at 21 kHz. There is noise on any level, but always at a very high frequency. 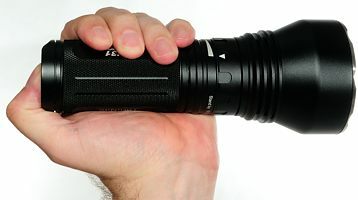 The light was supplied by ThruNite for review.